Springtime weather and other stuff. Long Steps progress, sailing SEI at last, and a nice blog to read. Its raining. Not a howling horizontal fire hose kind of rain like yesterday, or a misty just enough to get you wet before you realise it but an honest, steady soaking into the ground to get the spring growth going kind of rain. All day. 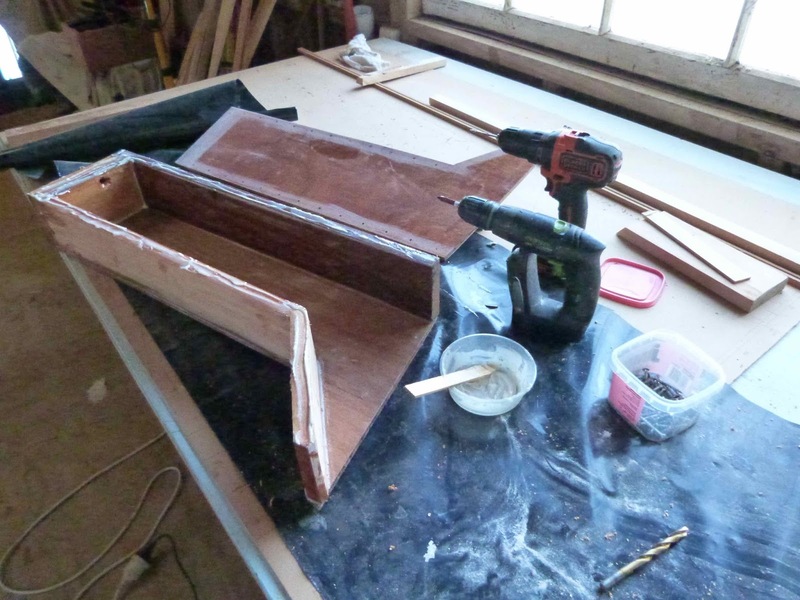 I’ve spent the morning in the workshop cutting holes in my boat, making the openings for some of the 6 screw ports that will give access to the compartments under the side seats in the cockpit of Long Steps. There are two compartments at the forward end that are divided off from the rest of the volume, those access from inside the cuddy, and I’ve put a port in each side which gives access from the open area of the cockpit at the after end. There will also be a port in the seat tops about halfway along. Why so many? These are long spaces, and its really frustrating to have something roll so far in that I cant reach far enough to get it. There will be more, two in the cuddy floor, one in the cockpit floor to access the space aft of the ballast tank, and one in the ballast tank itself so I can reach in to undo the filling and draining bung, and to make an opening so I can fill the ballast compartment with a bucket, then put the port in to seal it. Each one of these has to have a fairly close fitting hole made in the bulkhead or cockpit floor, has to have a doubler fitted behind it to ensure that there is thickness enough for the securing screws, and to make the edges of the opening stiff enough that it cant bow or buckle under the pressure of the fastenings. That was a mornings work, leisurely work, but work. I also started on some of the fittings. The rudder gudgeons bolt through reinforcing pieces glued and screwed to the inside of the plywood transom, total thickness close to 30mm, and those pieces are connected to and braced by other structure in the stern compartment. I DON’T want the rudder to come loose, so for insurance, plus making sure that water cant get at the plywood end grain I drilled the holes for the 8mm stainless steel bolts that will hold the fittings, then got in there with the little router and counterbored those holes in about 20mm at 20mm diameter, then with epoxy glue mixed with a little bit of microballoons to prevent the mix from running out, I piped them full of mix, forcing the epoxy right through the original holes as well. I’ve over filled them so they’ll sand off flush, and will when the mix has set hard, redrill the holes. Why? Strength plus if I hit something hard with the rudder the shock loading wont disturb the epoxy enough to allow water into the plywood end grain. In addition to that, each bolt will have a large section neoprene “O” ring between the transom and the fitting, said “O”ring being coated with Anhydrous Lanolin. I’ll make a countersink in the epoxy, enough to seat the “O” ring about half its depth into the countersink, and when its compressed it will be a totally watertight fit on the bolt, the fitting and the transom. I took two half days “off work” this week, off the engineering work that is, rigged little SEI on the first day, then was sitting watching the miserable misty rain and the very brisk wind on the estuary thinking, well, you all know the words, when a missive arrived from my friend Paul who lives just down the river a couple of miles. He asked if I was going to sail the boat today? Should he bring his camera? Ok, it was about 15 minutes shy of high tide, there was a tiny hint that the rain would ease and being honest the gentle indirect light was near perfect for photographer Paul to work his magic. By the time he arrived I had the boat rigged with a reef tied in, she was slid off the dock and into the water and I was away. The worried look was not justified. She is stable and felt steady even though the weather was not what you'd normally want on the day you sailed a brand new design for the very first time. 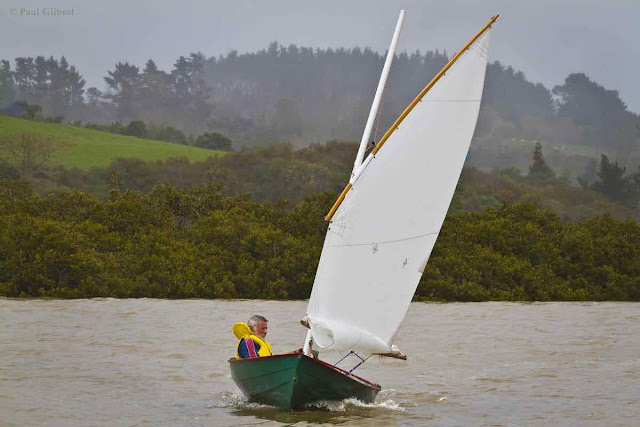 She has nice balance, accelerates well, steady and stable, carried that reefed sail in gusts of more than 30 knots ( Metservice official stats said winds up to 45 km H at about that time), she tacked reliably, tracked well and pointed up well. The wind had eased a little by the time this pic was taken and she was about powered up right for the strength of the breeze. 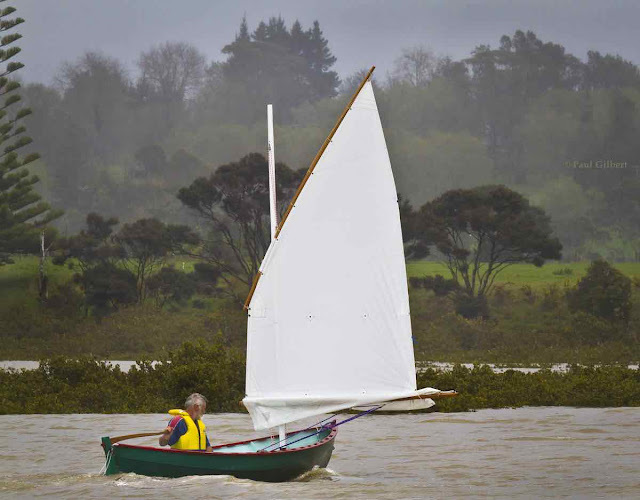 I sailed her in very light winds next day, the river being like a mirror with a few tiny ruffled patches I was coasting from one tiny puff to the next under full sail. All good. I took her out on the midnight tide last night, there is really only water to sail in for around an hour at the top of the tide and the moon was out, so I slid her off the dock and went out down the river a ways. I might just do that more often. I'm pleased too that Paul took pics, he’s better than good with that camera, Paul Gilbert! Photographer. Remember him if you want pics at a special event. Every now and again I get an email from someone who’s built one of my boats that really lifts my spirits. I got one yesterday from Ryan and Chris about my little “SCRAPS” design, a tiny yacht tender, built from whats left from other projects, hence the name. If you scroll back a post or two you’ll find pics of the build as well. Nice work people, thanks for keeping me posted and thanks too for permission to link from here. You can check it out on the below40south.com website, that and other video clips are under the "Media" heading at the top of the home page. He's going to be living on board for much of the next month, sailing her on Lake Michigan to check that everything including himself is all as it should be, then the little voyager goes in her crate and gets shipped south, a long way south to where we'll meet her in Punta Arenas, Chile. We'll pull her out of the box and set up the boat and rigging, do the inspection thing with the Armada De Chile and our friend Captain Herrero the boss there. We'll buy and prepare stores, load her up and test sail her and then, ( gulp, I'll be chewing my fingernails) will wave as he sails off into the cold grey green waters of the Straights of Magellan. Mast box, plus some work to get SEI ready to sail. Oh yes, and the first few days of spring. I’ve not had much time in the workshop this week, so there has not been a lot of progress in there. I did though have a nice three day stay with Denny and our family in Hamilton, got to see the granddaughters, went to Oropi hot pools with the BOP group for a meal and a soak, and arrived back home to a long list of chores. As well as catching up on customer questions and drawing work I’ve five engineering jobs on in the next four days so its going to be quiet in the shop for a little longer. It does pay well though, and thats really helpful in funding projects like “Long Steps”. I've been able to get in there for a few hours though, used that time to build up the main mast box. Its all glued and screwed together now, there are some reinforcing pieces still to go on but this afternoon I got it fixed in place on the after face of B#2. This is the mainmast box. Its been carefully coated with three coats of epoxy, all the seams pre primed, and the corners filleted with a small glue fillet, the drain hole drilled and sealed, and the drain fitting screwed into the bottom the mast step box ready to put the last side on. From here its "let the glue go off, sand its outside corners rounded and then put it in place. The main mast step box in place, held by glue plus screws through the two layers of 9mm plywood on the bulkhead and screws through the 20x30s on each side of the vertical web / spine underneath. There are reinforcing pieces to go in yet, plus a fore and aft beam each side at the top. You can see the far side one sitting there ready to fit, thats not only the support for the top of the mast box but is also the deck support for the cabin top. This is one of the most highly stressed parts of the boat, and I DONT want it to come loose. 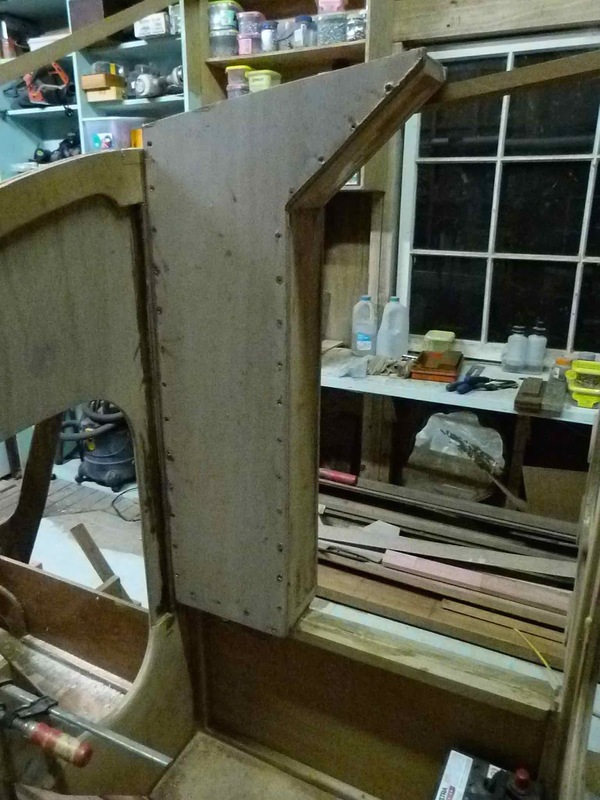 There will be a very similar one back between the transom and the next one forward. I had a little win today, Dean Pannett of http://www.nzcomposites.com lives just over the hill from here, and supplies glass cloths, epoxy, carbon, kevlar and all sorts of stuff useful to a man buiding a boat. His prices are great, service good, and I picked up some epoxy to keep me going. Another interesting place, I asked Dean who in town here supplies rolled carbon fibre tubes, and was told about C Tech http://www.c-tech.co.nz who among other things have a standard range of carbon tubes, two of which, although they don’t know it yet, will be holding up the sails on Long Steps in a while. I’d been told about these guys before but Deans reminder spurred me into looking for their website to see what they do. I hope on my travels to be calling in there to check them out more closely. On Thursday last it was the first day of spring for us here in the South and as I want to do more sailing than I got in last year its time I got on with rigging SEI. I’ve had a day off, most of the day anyway, and spent a couple of hours of that prepping the spars for SEI s rig. Today I’ve leathered both the yard and boom, bolted on the fittings and begun lacing on the sail. The leathering was done with an oar leather kit from Duckworksboatbuilders supplies , I did the oars with the original kit and that’s holding up really well, had some nice split calf ( a grade of leather, fairly light) on the shelf so used the needles, punches and thread left over from the oar kit to do the leathering job today. White split calf leather, herringbone stitched, double cross stitched at the ends, almost decorative. This should go well with the white sail. 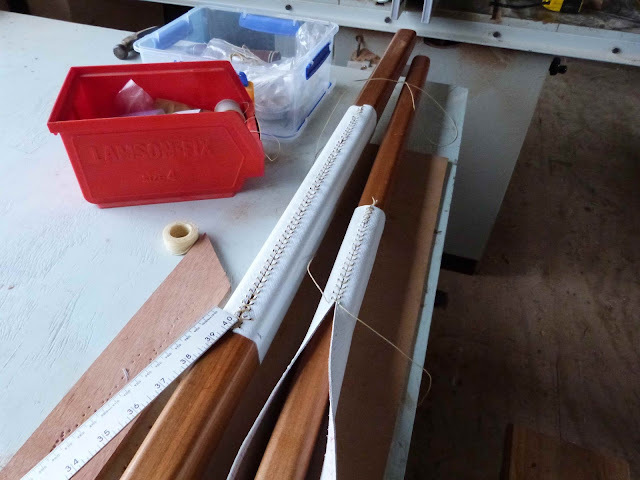 The leather is there to stop the chafing where the spars cross the mast. These are great kits, sometimes its difficult to find the special needles, the heavy waxed linen thread, the tallow and the leather to do these jobs, and in these kits it all comes as one, including a piee of tape measure, good clear instructions and the little punch to make the holes. I’m a fan. Nice sail by the way, extremely good value for money. 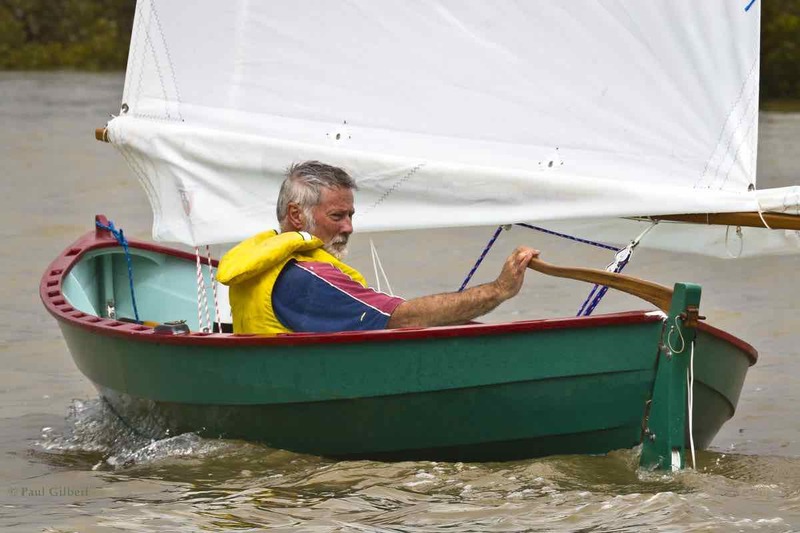 Mik has some very helpful tutorials up on his site, very useful for setting up and tuning a Balanced Lugsail.